Bunny’s kids are growing up so quickly! Last week, they were interested in eating mainly as a novelty, but this week everyone (almost everyone) attacks the food dish like a pack of piranhas as soon as I put it down. Frank is the only holdout (there’s one in every litter). He’d much rather just have his mom feed him, thanks – all that sticking your head into a bowl seems like too much work. In part because of this, he’s no longer the ‘big’ boy – his brother Friday is now the larger of the two. It’s not like Frank is thin – he’s just not bigger than his brother any more. Billie, on the other hand, looks forward to eating like an addict looks forward to crack. As soon as we enter the room, she screams like a banshee until you drop the dish in front of her, at which time she’ll actually climb right into it to stake out a prime eating spot if you don’t stop her. At just under five weeks old, the kids still toddle on their feet a bit unsteadily. It’s adorable to see them climbing into their litter box to poop, especially since doing so is quite a production number for them. It’s not easy climbing in and out of that doorway when the edge is the height of your shoulder! I love litter box trained puppies. Between that and their raw diet, it’s a joy come into their room every morning. No big messy piles of poop with footprints through the middle of it, and no sopping wet newspaper to peel off of the floor. I am working on installing the new version of iLife, and giving myself a crash course in how to use it, so hopefully a video update this weekend. In the meantime, enjoy some photos! Bun Pups at 2 Weeks Old, and meet the new kid! I can’t believe how much the little munchkins have grown in two weeks. The littlest boy, Friday, is already up on his feet and motoring around the whelping box. He’s a wiry little thing – when you pick him up, he almost does a back flip out of your hand. His brother, on the other hand, is doing an excellent job of impersonating a beached walrus. He wakes up for food, but pick him and he’s content to just lie there in your hand, getting his tummy rubbed. Little Miss Mine is also of the ‘beached walrus’ school of thought – “why move? Food comes to me, which is as it should be”. Lately, she’s been eating so much her wittle belly hurts, which has made for a few fun nights. Colicky puppies, like colicky babies, are the enemies of sleep. We also have a new addition to introduce – Little Miss No Name Number Two, aka LadyBug (her breeder’s name), aka our new Mastiff puppy. She comes to us from Jospeh and Connie Lovece, of MCF Mastiffs. We could not be more thrilled with this (big) little girl – she’s already learned ‘sit’, ‘down’ and ‘stand’ (yes, Hope – I’m using a clicker!! ), and we’re working on “peeing is for outside”. She loves the snow – and considering where we live, that’s very good thing. She and Brigid are slowly making friends – Brigid at first was stunned, but now they’re sleeping curled up in the same bed with each other, and generally being pals. As for names, we’re mulling them over. I like McKenzie, even though we’d be stealing it from Gina, while Sean likes Colette. I voted for June Bug, but got over ruled. By the way, Connie has GiGi, from Barb, which allows us to play a nice little game of “Six Degrees of Separation” – Connie has Gigi, Gigi was out of our Dark Lola, Lola went to live with Lauren in NYC, and then Lauren got Harley from us, who is Bunny’s puppy from her first litter. Let’s face it, get a Frenchie from us, and like it or not, you’re part of one great big extended family. 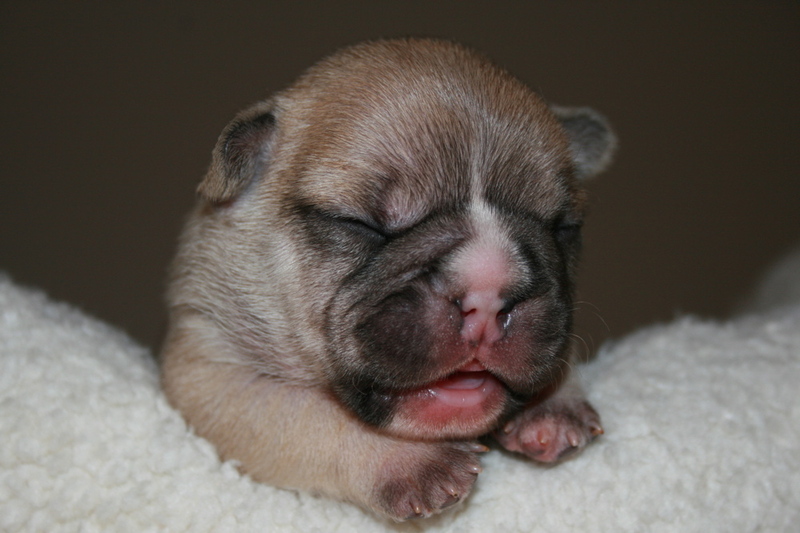 https://i0.wp.com/www.bullmarketfrogs.com/wp-content/uploads/2015/04/Brindle_pied_frenchbulldog.jpg?fit=662%2C662&ssl=1 662 662 Carol http://www.bullmarketfrogs.com/wp-content/uploads/2015/06/bullmarket-logo.png Carol2011-02-19 16:12:572011-02-19 16:12:57Bun Pups at 2 Weeks Old, and meet the new kid!